Images of 'Count Louis', appear here: https://www.flickr.com/photos/boxbrownie3/6949443979 (taken on the Fairbourne Miniature Railway) and here: http://www.geoffspages.co.uk/raildiary/eveshamgala_htm_files/32.jpg (taken on the Evesham Vale Light Railway). The following appears in the November 2016 issue of Motor Sport, and is reproduced here by kind permission of Gordon Cruickshank, Editor-at-Large, and Tim Jones. If you were making a silent film about an evil count tying the heroine to a railway line, you’d ideally want a real count and a real railway. Step forward Count Louis Zborowski, who in 1924 built a railway around his home - and then made a melodrama around it. This has only recently come to light, thanks to Tim Jones, a senior lecturer at Canterbury Christ Church College. While researching amateur cine film made in Canterbury, he made contact with Helen Jarrett, who had 72 rolls of film taken by her grandfather, Sydney Bligh, of Bligh Electricals, a Canterbury firm. Jones already knew that Bligh was a keen amateur film maker who made newsreels of the area in the 1920s and ‘30s so this was a treasure trove. After immersing himself in hours of Bligh’s fascinating local reportage, he came to the last two canisters. “I left them to the end because they said “Count Drama” and it didn’t mean anything to me”, Jones says. These last two canisters viewed contained images of 15 inch gauge railway track and Jones knew immediately that it had to be Count Zborowski’s lost track at Higham Court. The railway ran for more than a mile through the grounds of Higham Court and was more than capable of hauling real passengers. The Count and his model railway enthusiast friend Captain JET Howey (subsequently of Romney, Hythe and Dymchurch fame) schemed a complete miniature express railway but all came to a stop when the Count was killed at Monza in 1924. The films showed fascinating unseen film of the railway and the magnificent quarter-scale Bassett Lowke 4-4-2 express locomotive – but, unexpectedly, it was in the form of a spoof thriller made by the Count and his fellow racer Clive Gallop. Tim’s discovery is a find on several levels. It is unique pictorial evidence of the railway, showing that it crossed the main drive (scene of one of the hold-ups) (and ran in a U or even a circle a round the house. As the loco was delivered in Spring 1924 and Zborowski died in October of that year, the dating is clear. 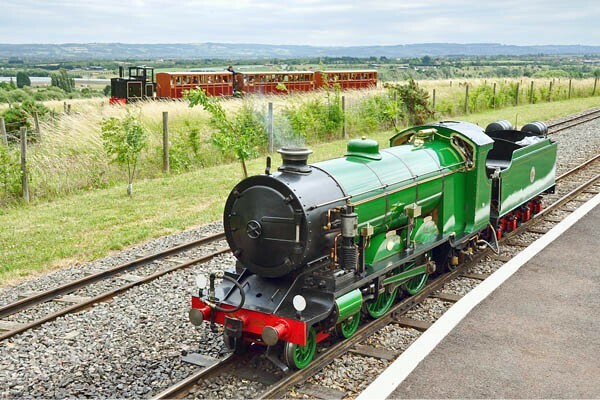 The track, said to have been recovered from WW1 trench railways in France, was removed soon after Zborowski’s death and became part of the Romney, Hythe and Dymchurch railway, where Howey finally realised their dream of a working miniature railway. The loco, named Count Louis, remains in private hands. Cinematically, Tim’s find is extremely early: “16mm film was only released in 1923 and the first camera, the Cine_Kodak A, which is probably what the Count used, was the price of a Ford car. Bligh was a radio pioneer, and it’s said that he installed electricity at Higham. But since his own films only start in 1927, my best guess is that he used the Count’s own camera”. Known for his flashy lifestyle and riotous parties at Higham, Zborowski was still only 29 when he died, and clearly doesn’t mind hamming it up in the film. “Later on the baddies plant ‘dynamite’ in a chicken shed” Tim explains. “Zborowski was known for blowing things up – apparently he would bury charges in the flower beds and trigger them when visitors rang” Eventually the treasure is ‘dug up’ from a drain in front of the Higham garages, where the Count worked on his cars, including the Higham Special, which in the hands of Parry Thomas became Babs. Zborowski’s short but eventful life earned a good deal of gossip column coverage but this glimpse into his private life adds a new angle to a fascinating character. Who would have thought that film research would turn up such a gem?